Holly Golightly: He's all right! Aren't you, cat? Poor cat! Poor slob! Poor slob without a name! The way I see it I haven't got the right to give him one. We don't belong to each other. We just took up one day by the river. I don't want to own anything until I find a place where me and things go together. I'm not sure where that is but I know what it is like. It's like Tiffany's. Just like Holly Golightly (played by the mesmerizing Audrey Hepburn in the 1961 flick, ‘Breakfast at Tiffany’s’) was crazy about Tiffany’s, I am mad about food. Most people would agree with me when I say that. For the rest, all the food pictures in my album and the last few posts should suffice. This isn’t the Pad Thai post, so don’t get your heartbeats faster. It’s the next one, I promise. This Sunday morning, August 24, I and my colleagues decided to check out the famed breakfast at Flury’s on Park Street, Kolkata. So we are up in the morning, and finally leave by around 10.30 am. Wondering if we‘ll get ‘The Breakfast’ post-11 am, we somehow manage to reach the place. Park Street is an experience in itself. The way the place changes it colors through a day is mind-boggling – Work Center during the day, roadside market and hangout place in the evenings followed by, of course, the amazing nightlife! 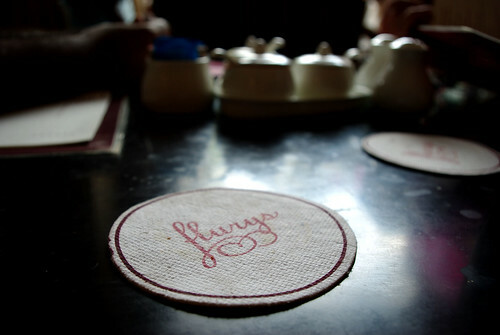 On the sleepy sunday, we alight at Flury’s. Most would find this hard to believe but this was the first time I entered the famous place in the umpteen years, though in bits and pieces, I have been in Kolkata. Typical of any Park Street eatery, the first thing that strikes you when you enter is the age of the place. The second thing is that the whole place is still functioning at that age. Flury’s does stand out as an elite place. I haven’t felt that at the other famous restaurants on Park Street. The third thing, of course, is the amazing smell in the place. You can’t blame your stomach if it starts growling as soon as you enter! The restaurant has a smoking and a non-smoking section. We were seated in the non-smoking area, not that I mind. People-watching, you see an amalgamation of people here – the party crowd after a whole night out partying, the family out for a nice, healthy breakfast, the tourist who’s attracted by the fame of the place, the regulars who are here for their cup of tea. 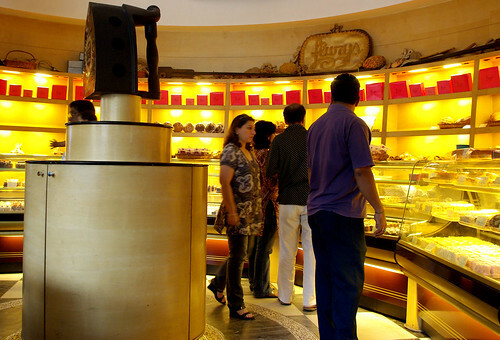 On one side of the restaurant is the brightly lit confectionery corner where you get all sorts of freshly baked breads, cakes, pastries and so on. 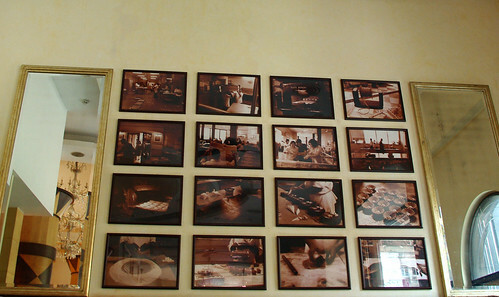 The walls are decorated with sepia print photographs, the ceilings are old and endowed with colonial fans and chandeliers. You immediately feel relaxed and hungry. We are given the menus and I am shocked to see the prices. This place is insanely expensive. Now, I have been a breakfast man. I may not have it very often but when I have the time, I thoroughly enjoy the meal. So it may not come as a surprise that I have had breakfast at a number of places. Be it the vast spread at the breakfast buffet in Residency Towers, Chennai (INR 175) or the innumerous English breakfast joints in Goa (INR 100-150). Trust me! I know my breakfast and I hate to admit that this was the most expensive breakfast I have had. 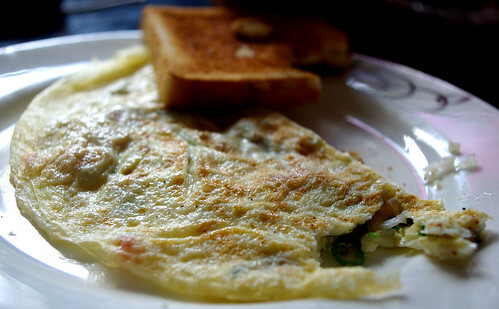 Just to give you an idea, an omelet costs INR 180, a milk shake INR 120 and an all day breakfast INR 310!! Rub your eyes and read the previous sentence again. Anyways, let’s leave this out of the discussion and continue with the breakfast. We order two all day breakfasts, a masala omelet and a milk shake. The service is not the very best. But then, there’s no reason why anyone would want to hurry through a Sunday morning breakfast. This is an experience to be enjoyed. 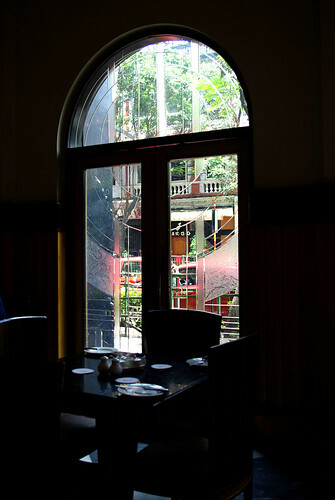 There are large windows which overlook the main street. You see the hustle bustle outside while listening to Amy Winehouse in the background and chatting with your friends. The waiter arrives with the orange juice and the milk shake. 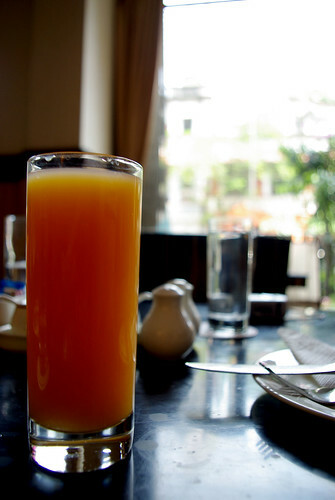 The orange juice is thick and fresh – not canned but fresh. My friend says the milkshake’s yummy too. Now, I am hungry – enough of the experience BS to convince myself. I think the waiter heard my tummy roar because he arrives with the breakfast and the omlette. Let’s get down to business. 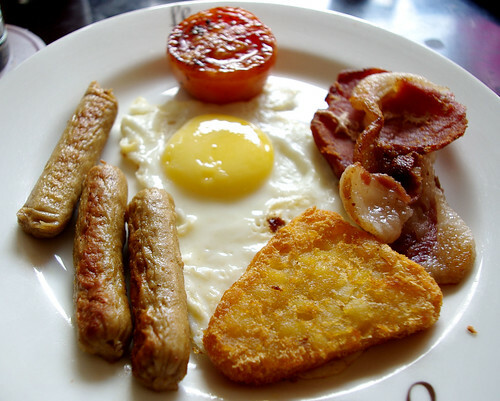 The breakfast includes an orange juice, a fried egg, three sausages, a hash brown, bacon, tomato, brown/white bread and a choice of tea or coffee. The fried egg was well done – nothing fantastic about it but not messed up either. 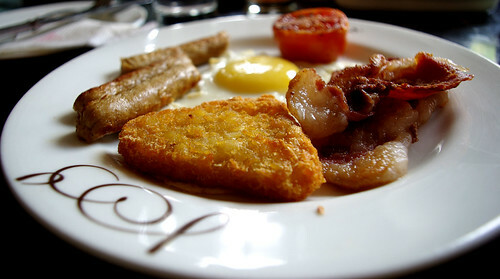 The hash brown was unhealthily tasty but then, fried potato is something I can devour. The tomato was a tomato. The bacon was funny because the first piece I had was very soft and sumptuous but the other one was dry and I literally had to tear up pieces to have them. The least they could do was provide a sharp-toothed steak knife. The sausages were out of this world. No frozen crap but fresh out of a butchery. Very soft and tasted amazing. I have a small piece of the omlette too. Although I do not want to mention how over priced the place is, I just have to when it comes to the omlette. I have had as good an omlette at Hi-Look near the IIT Madras main gate at 2 in the morning for 10 bucks. Finishing off the breakfast with some nice tea the proper British style, we sit back and enjoy this beautiful Sunday morning. I am in a time machine, I am in the ‘30s. This is how life should be. This is how life is meant to be. To relax and not worry about a thing in the world. To not think about the daily mundane life. To lose yourself in a place which has lost itself in time. I've had breakfast here once. There is a choice of menus there, I think and I took one different from yours. I don't have issues with the quality. But the prices are indeed exorbitant for a slice of laid back life not lasting more than 45 minutes. 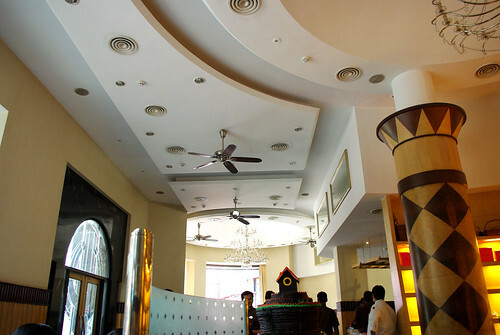 People flock here in large numbers especially around Christmas and New Year, more for its antique value. An omelet is an omelet after all. 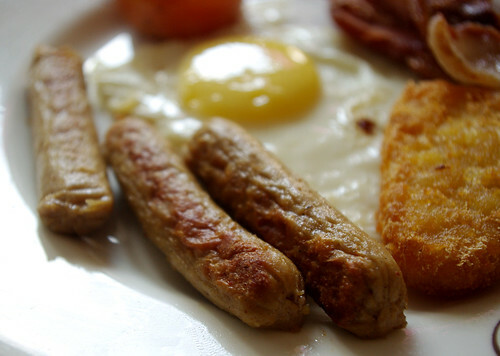 How superior can it be from the stuff other breakfast serving eateries dish out? 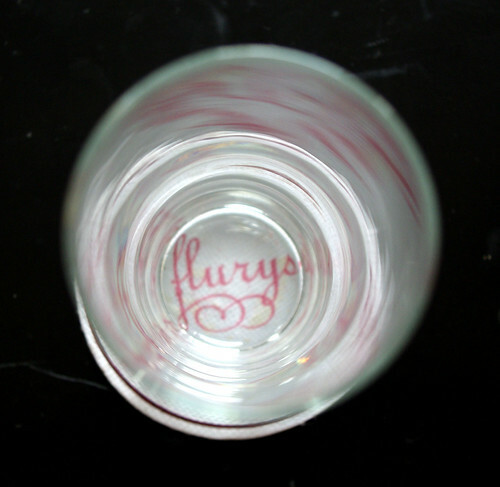 It can be worse, though no such possibility exists at Flury's. Hmm, its look like a one of the good restaurant to have sit and place an order a delicious cake, juices, Sausages, Omlette and few other things.